When I began promoting the Chinese Wand Exercises, many within the Tai Chi and Qigong community were doubtful that there was a tradition in China that used a stick about four feet long for Qigong-like stretching and strengthening exercises. A good deal has been written in the twentieth century about the `Tai Chi Ruler’ and `Bang’ and these arts have many Chinese practitioners. Yet Bruce Johnson’s 1977 book `Chinese Wand Exercises‘ was the only modern-day documentation supporting the idea that there was an ancient Chinese health art using a `wand’. I found evidence of traditional wand exercises in China and Taiwan. 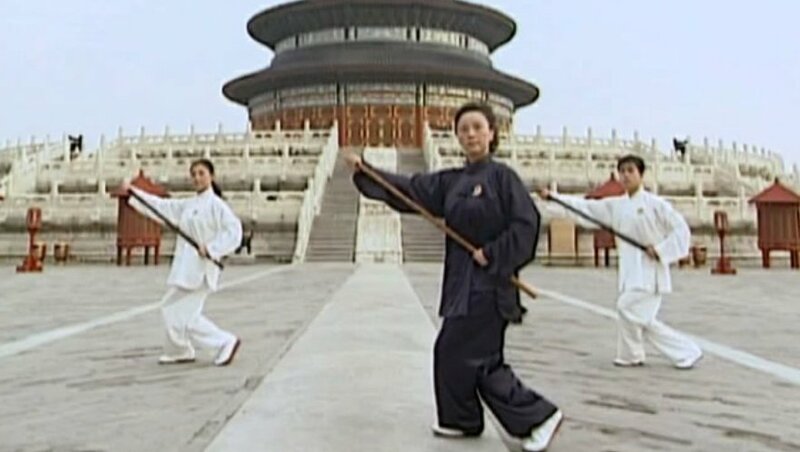 In China, arts such as `Biangan’ (the Tai Chi `whip’ staff) have been increasingly practiced as a health form and the Wudan Short Staff, which is about the same length, has similar exercise elements besides the martial applications. There is also a health and fitness exercise in Taiwan that uses a three foot pole. But the creation of the `Taiji Stick Health Preservation Exercises’ by the Chinese Health Qigong Association (CHQA) is a watershed; it vindicates Bruce Johnson’s historical thesis. Here is the background. The CHQA created the routine from scratch, using footwork and body mechanics of Tai Chi and some movements taken from ancient Qigong documents. I am thrilled that as a result of their work more people will also come to know Chinese Wand Exercises. The following video relates in Chinese how the Association came to create the form. The routine has the opposite approach to the wand exercises passed on to Bruce Johnson (which targets specific parts of the body to trim and strengthen). The Tai Chi stick health preservation exercises are lead more by philosophical principles such as stimulating certain acupuncture points. So although the routine includes some stretches it comes under the category of therapeutic gentle exercise like Tai Chi rather than a total health and fitness routine. For their Tai Chi Stick Health Preservation Routine the CHQA used the character “杖” (zhang) for the wand, which means `cane’, `stick’ or `rod’. They placed the characters `太极’ (Taiji) before it and added the Chinese characters “养生” (Yang, to preserve and sheng, health) to create the phrase `Tai Chi Stick Health Preservation’. The wand is used at various points to massage acupuncture points (rather like the Taiwan Wand system that uses a three-foot wand); it also combines flowing Tai Chi-like movements and some static stretches. 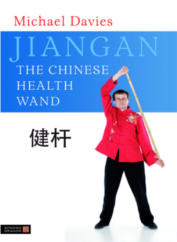 In my book `Jiangan – Chinese Health Wand‘ I used the character `杆’ (gan) for the wand, which means `pole’ or `staff’. I placed the Chinese character `健’ (Jian) which means `health & fitness’ before it to make the phrase `健杆’ (Jiangan) meaning `Health and fitness wand’. This is reflected by the fact that the techniques are ideal to build robust fitness as well as a healthy body. The Stick, or `Zhang’ used by the CHQA is usually 105 to 125 cm long and 2.3 to 2.8 cm in diameter. The sticks used by the CHQA in their demonstrations are 125cm (48 inches long) – the the most convenient length for the average person and the length suitable for most wand exercises. Wands that are much shorter than this make it difficult to move the arms around the back of the head. It does seem as if some practice with this shorter wand – which makes it very awkward to achieve some of the movements. Rotating the body from the waist helps stimulate Dai meridian channel, which is responsible for thorough circulation in the meridians, and is good for the smooth flow of qi throughout the body. Rowing movements promote digestion and intestinal health. Ankle movements stimulate Foot-Sanyin meridian and Foot-Sanyang meridian, and also regulate the functions of the liver, gall bladder and urine bladder. Shoulder rotation helps prevent and cure shoulder arthritis and lessen shoulder pain. Bending the body helps stimulate the gall bladder meridian, Chong meridian channel and Ren and Du meridian channels, regulates your liver and gall bladder, suppresses liver yang hyperactivity, and promotes unblocked circulation of blood and Qi. Turning your waist, straightening your legs can stimulate Ren and Du meridian channels, Dai meridian channel, and Feet-Sanyin and Feet-Sanyang meridians, promote circulation of blood and Qi, invigorate your kidneys and strengthen yang. Turning waist and straightening legs helps increase flexibility of your lumbar vertebrae and hip joint and stretch the muscle groups of the wiast and legs thereby improving their flexibility and agility. Guiding the movements with your stick will calm your mind, relax your body and keep y our mind concentrated. coordination of breathing and movements helps you to get rid of stale qi and take in fresh air. The association back up what Bruce Johnson said about Jiangan’s `Greeting the Traveler” posture in their own version….`raising your head and bending your back effectively stimulates Dai meridian channel, and Ren and Du meridian channels. This helps the circulation of blood and qi, invigorates the kidneys and strengthens the abdomen’. There are no specific claims in the book about what particular techniques bring about a particular benefit; they mention broad general terms, i.e. shoulder rotation, bending forwards, turning waist, ankle movements and rowing movements. I agree with all the above points, which also apply to the way we use the wand in Jiangan. In comparing the Tai Chi Stick Health Preservation Routine to Bruce Johnson’s linage wand exercises we must consider the fact that Johnson’s style repeats each posture several times as we gradually work our way to the `end point’ of the posture. The Tai Chi Stick Health Preservation Routine has no gradual stages and every practitioner moves to the same point as the instructor, leaving the less able people to `go as far as they can manage’ in one movement rather than break it up in several stages like Jiangan. In Bruce Johnson’s linage the wand provides a fulcrum for balance, form and posture and resistance for stretching and strengthening. The hands are mainly placed at the end of the wand, which opens the chest. Curiously, most of the CHQA’s exercises do not make the most of the wand’s qualities. In a manjrity of the exercises the stick is held with the hands at shoulder width distance from each other. This means the more beneficial qualities of fulcrum and resistance are not used. This grip also lessens the range of movement available for beneficial wand exercises. The CHQA routine is an aesthetic moving form like modern Tai Chi and uses some Tai Chi stances and weight distribution. Almost all Qigong routines created or revised by the CHQA are heavily influenced by modern Tai Chi. This means that there is inevitably a similar feel to all the forms, as if they are all variations on Yang style Tai Chi. The bow posture and the associated transferring of most of the weight from the back leg to the front leg and back again is, as I have pointed out in other articles, not the most effective, efficient or safe method of exercising and strengthening the legs. This movement places quite a heavy load on the front knee. In my view the adoption of Tai Chi weight distribution lessens the effectiveness of Qigong routines and similar gentle exercise. The CHQA’s routine is a standing exercise only. There are no floor exercises to strengthen the `core’ muscles and parts of the body where weight tends to accumulate. So the routine is very much like performing a round of Tai Chi with a staff (similar to Tai Chi Biangan) but with some added massage and stretching. Although the CHQA has done an excellent job of creating a staff form with gentle movements, Bruce Johnson’s linage exercises provides the more comprehensive health and fitness routine.